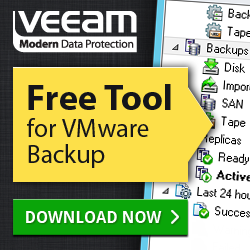 Last month Veeam have announced the offering of a new training and certification program, VMCE. The designation of VMCE establishes a level of expertise required to implement and configure Veeam software correctly and most effectively. The designation also verifies the engineer has the necessary knowledge and experience to be hired as a Veeam Expert.